Whatcom Reads! is a county-wide program in the NW corner of Washington State that encourages everyone in the community to read and discuss the same book. Libraries and other organiz ations provide programming during the year, but the high point each year is the author visit. A Tale for the Time Being was the featured book for 2016 and Ruth Ozeki came to Whatcom County March 3rd-5th. Did anyone besides me struggle with the phrase mise en abyme? 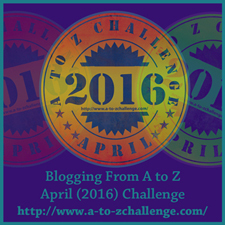 If you have read any of my earlier posts, you know that Ozeki offered twenty prompts in her preface and that I am using them for this A-Z Blog Challenge. Today, however, I’m using the French phrase mise en abyme as my propellant. Let’s take the word abyme, pronounced “meez-en-a-beem.” In heraldry, the word refers to the center of a coat of arms. Combined with mise en, it means “put in the center”––for example, a small shield within a larger shield, or in literature, a play within a play as in Hamlet. A broader application refers to self-reflection within a literary work. The literal definition is “into the abyss,” and that’s where Ruth Ozeki found herself as she began her ruminations. Those of us who approach the blank page are familiar with the variously attributed quote “Writing is easy. You just open a vein and bleed.” Ozeki’s prompts are antidotes to what she calls “the tyranny of choice. ”I’ve found them very effective—a bridge from a blank brain to a motorized one. But: I’m just not sure what “Event Scores” means. Any ideas? Ozeki is so complex. Thanks for figuring her out for us.